for canned food, this stuff is pretty good. when i dont have time to cook for them they get a can of this stuff as its 1 of the only canned foods they will actually eat! I have a Doberman x and a Bull Terrier x. One is picky and one isn’t. They both have no problem finishing off their dinner is record time. I like to buy kangaroo products as it’s lean. My Doberman is cross with kelpie so he needs a good diet because he never stops going! I pair this product with 2 cups of the kangaroo Kibble and my dog loves it! My dog has allergies, and even though this has a few other meats she has been good so far! Will definitely keep buying! 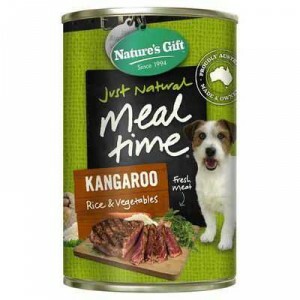 How would you rate Nature’s Gift Adult Dog Food Kangaroo Rice & Vegetable?